Rod Marsh has shed new light on Australia's failed Ashes campaign by admitting they felt they had the series won after a vast victory over England in the second Test at Lord's. 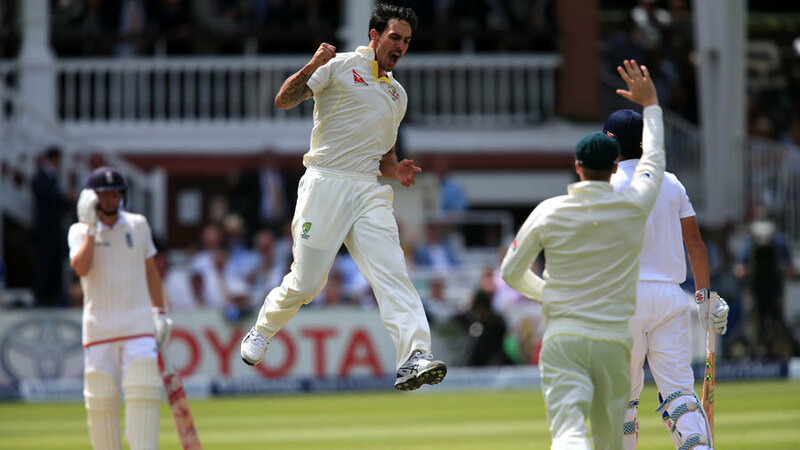 Following a heavy opening defeat in Cardiff, the Australians regathered to more than double the margin in the second match with a 405-run thrashing, and celebrated their first victory at Lord's since 2005 with plenty of gusto. But the series ledger was merely 1-1, and after their batting was obliterated on seaming pitches at Edgbaston and Trent Bridge, the heavily favoured visitors finished empty handed. Speaking as part of a panel discussion following his delivery of the 2015 MCC Spirit of Cricket Cowdrey Lecture, Marsh was asked by Mark Nicholas whether complacency had crept into Australia's defence of the Ashes urn won so convincingly at home two years before. "When we left Lord's I thought 'we will win the Ashes' because we'd played that badly at Cardiff, we played that well here, then we were just going to win," Marsh said. "If that's complacency, then yes we were complacent. But I think we all thought we'd broken their back at Lord's with such an emphatic victory. Geez we were wrong. We were that wrong!" Marsh's admission is sure to leave plenty wondering how the series was allowed to unravel, when Australia had gone 14 years without winning the Ashes in England. Fellow selector Darren Lehmann has publicly conceded that the selectors made several errors over the series, including the dropping of Mitchell Marsh for his brother Shaun on the opening morning of the pivotal Trent Bridge Test. There has also been heated debate over the delayed selection of Peter Siddle, who looked comfortably Australia's most dangerous bowler on seaming pitches when belatedly chosen for the dead Oval Test, while critiques of the tourists' batsmanship in the prevailing conditions have largely concluded that greater grit had to be shown. In contrast to Marsh, England's captain Alastair Cook said his side knew from the moment they defeated Australia in the first Test that they were capable of winning the Ashes. It was a belief that did not waver even after the Lord's drubbing, for they had seen how Michael Clarke's team could struggle in even moderately helpful conditions for James Anderson and Stuart Broad. "Australia came as firm favourites, but as a player and as a team you need to have a bit of substance in your belief," Cook said as part of the same panel. "You turn up to Cardiff and you look at the Australians and like we always do we probably build up the opposition in our own minds a bit. "Australia beat West Indies more convincingly than we did, they had an outstanding run of games. In my mind I thought we could win if we played to our absolute potential. "When we left Cardiff we knew these guys were beatable, and that was the big difference. We'd done it once, it was just whether we could do it consistently. But I know we could win the Ashes because we'd just beaten them, and we could put Australia under pressure in our conditions. "Everyone looked at each other at the end of that game, we had a few drinks in the dressing room at Cardiff, and that was the most important message I could get across to the guys. We've proven we can do it once, if you can do it once you can do it three times. They clearly ignored everything I said and we got hammered at Lord's three days later, but at the end of the summer we proved it."